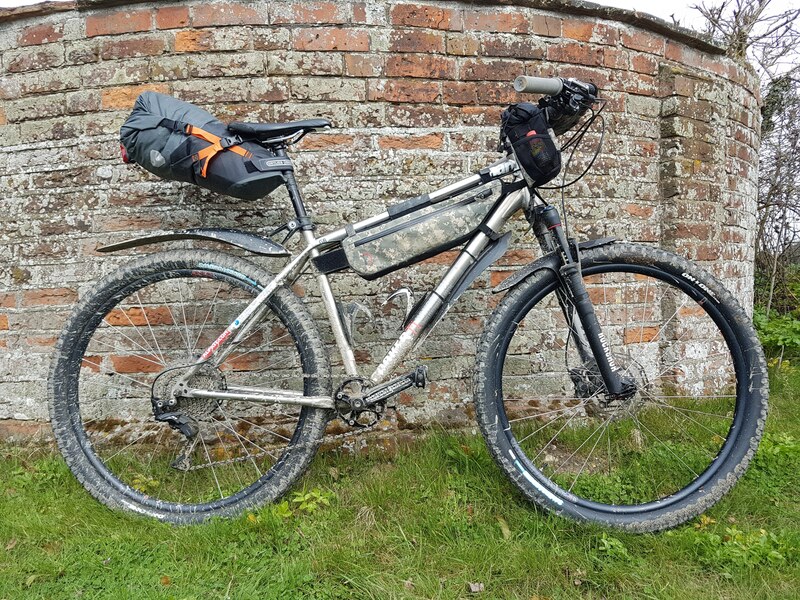 I’m not going to get into the debate about what separates touring and bikepacking, but using soft luggage instead of racks & panniers would be a popu lar starting point. A seatpack is the cornerstone of a soft luggage set-up. It isn’t quite so sensitive to fitment like a framebag or barbag. 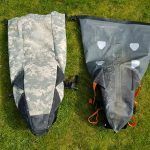 Seatpacks fall into two main types. the holster style like a Wildcat Tiger or an all-in-one like a Revelate Viscacha. 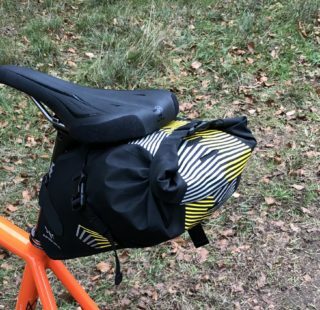 Ortlieb’s seat pack is an all in one, albeit with its own USP. Most bikepacking luggage is rated as water-resistant, if not actually waterproof, and made from VX or Cordura (or a mix of these fabrics). The materials themselves are usually waterproof but as they are stitched together, it is almost impossible for the finished product to be completely water proof. It is amusing to note that Ortlieb might be relative newcomers to the Bikepacking world but they have been in the touring luggage game since 1982. Ortlieb include the word waterproof in their company branding so in theory, if you use their luggage, you won’t need additional dry bags. Your stuff should remain bone dry. To this end Ortlieb avoid the sewing machine and use High Frequency Welding to bond the seams. 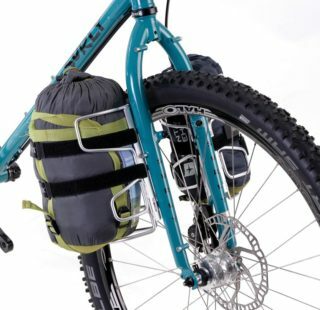 Revelate products are often the benchmark for bikepacking bags so the other seatpack pictured is their Viscacha model. Do bear in mind that the Viscacha is a couple of years old and has seen a lot of use! The Ortlieb is made from a ripstop material that is thin but robust. The lower half is made from a coarser fabric. Which makes sense as the upper half is the part that gets rolled up when securing the bag. There is some internal plastic reinforcement where the bag is held against the seatpost. This stops it deforming when the strap is pulled tight. The buckles are a good size and the nylon webbing is wide enough to give you a good grip when cinching the straps up tight. There are helpful cut-outs at the rear for your rear light as well as reflective patches. Ortlieb claim a weight of 325gms which is borne out by my kitchen scales (330gms including a bit of dirt from use!). The Viscacha is about 150gms heavier. The welded construction means that the Ortlieb doesn’t have large internal seams which, along with the fabrics slick finish, helps you cram your gear in a bit easier. 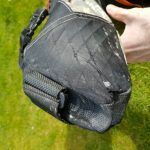 Compared to most other seatpacks, the reinforced tapered section where it meets the seatpost is more “open” and allows you to get your kit right up to the end. You can see on the Viscacha where the seatpost strap and “empty” taper deforms when fitting. 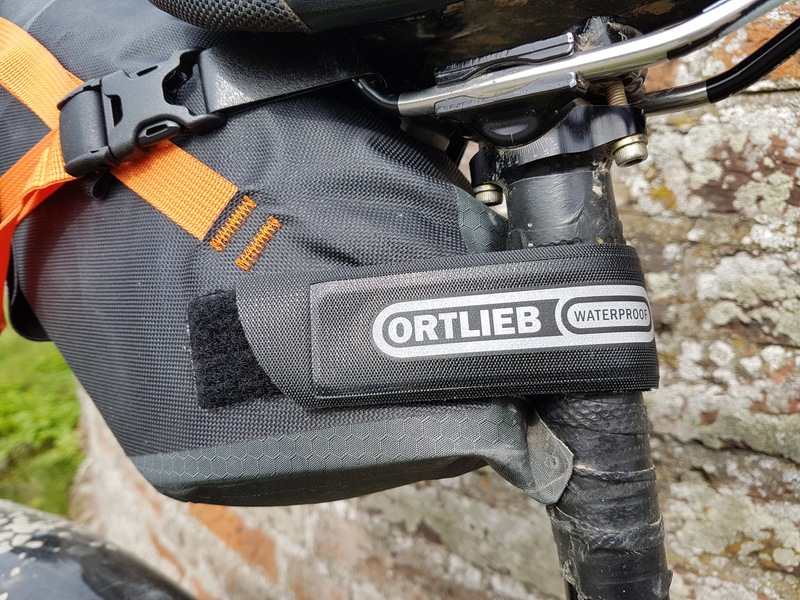 Being waterproof, the Ortlieb needs an air-release valve. Without it, air couldn’t escape making it nigh on impossible to pack successfully. The valve is simple to operate and it’s a doddle getting the bag closed securely before popping the valve shut again. The volume is quoted at 11 litres. To put this in context I tried to fill the Ortlieb to its’ capacity with typical items for an overnight outing. 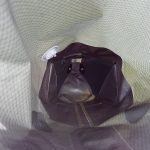 I made sure that the bag could be closed comfortably with sufficient roll-overs to retain waterproofing. 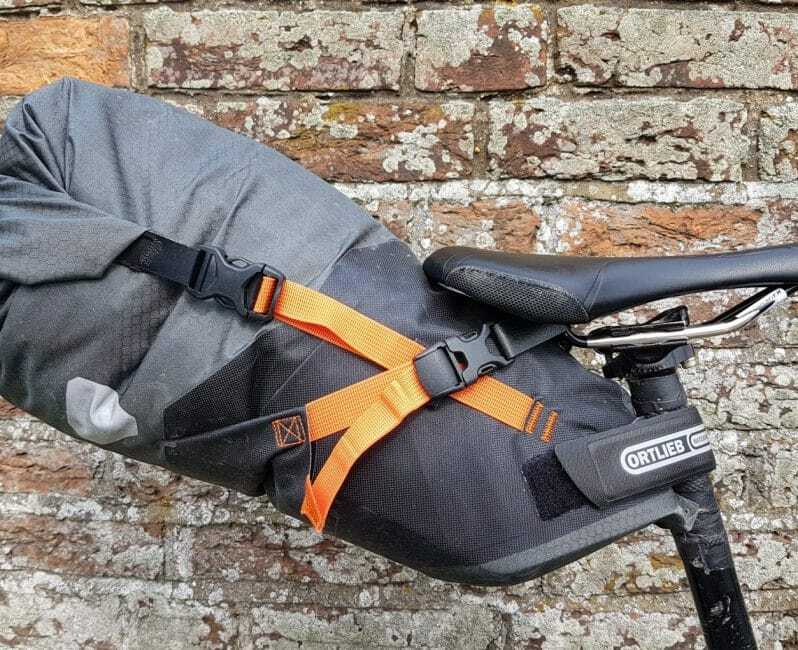 It’s worth noting that this medium pack rivals the Viscacha (Revelate’s larger seatpack) for volume, despite the Viscacha claiming an extra 4 litres capacity! 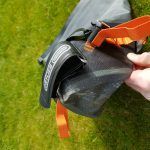 The large Ortlieb seatpack is 50% bigger which could prove useful for longer trips or winter rides where you need to bring along some extra insulation, or just if your frame/fork design didn’t lend itself to fitting a bag. Fitting the Ortlieb onto your bike is pretty much common with most other seatpacks. 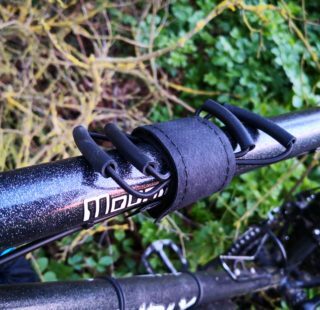 The saddle rail strap is screwed into position and the clips are on a flexible strap. Compared to the Viscacha this makes it much easier to load onto the bike when full. The Viscacha strap is stiff and only retained in its loop with velcro. A loaded bag often pulls to one side making the second clip difficult to secure. 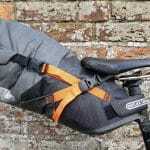 Although it only has a single seatpost strap, the alloy buckle and internal reinforcing let you pull it nice and tight. A common complaint about seatpacks is that they can be prone to wag in use. This can be mitigated by careful packing but some designs are clearly better than others. The combination of the reinforced taper and webbing locks on the saddle straps, lets you pull the attachments really tight. Then, they stay that way. I didn’t notice any untoward movement when using this seatpack. Having covered a few hundred kilometres both on and off road in grotty weather I was pleased that the Ortlieb kept the elements out. To be honest, it wasn’t really tested by adverse conditions. To simulate more extreme conditions, and because it needed a clean, I popped a dry towel inside, sealed it up and submerged it in the bath. Then I treated it to the shower at full blast. Not a drop got through. 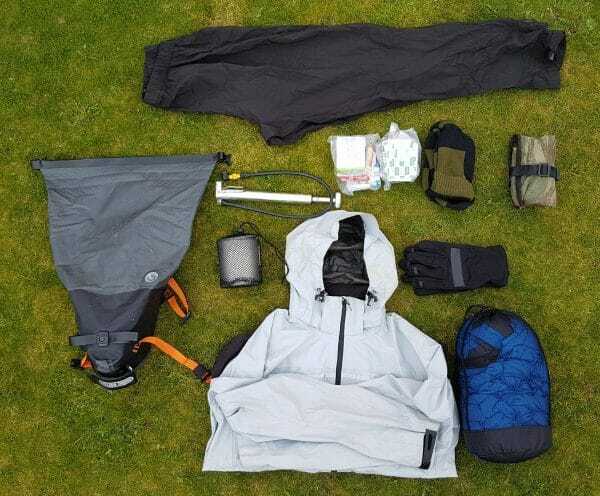 As long as you don’t hole the seatpack, you can be confident your kit will stay dry. 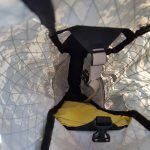 This opens up options of packing your kit in mesh bags, rather than dry ones. It’ll weigh less, compress down more, and make it easier to find what you’re looking for. Win, win, win! Often, big firms jumping into a niche fall short of expectations by sacrificing durability/function for price, or else match the quality but don’t pass on the savings from mass-production. Ortlieb however have used their 30 years experience to produce a well made and great functioning original design that isn’t merely a rip-off of the little guy. For just over £100 you get a robust, well fitting, waterproof and (if it matters to you) European made product.